Gears of War: Judgement will be arriving on shelves later this month. Epic Games and People Can Fly have been doing a good job of supplying the requisite hype for the game par for the course. A flurry of trailers and tidbits have been released over the past couple of weeks, with an Xbox hosted live reveal taking place yesterday. It has also been revealed that Gears of War: Judgement will feature a second campaign for people willing to go out of their way to unlock it. 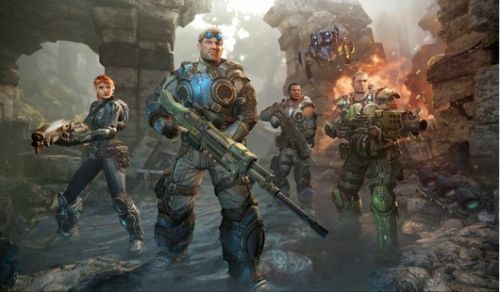 The campaign in question will show us what Baird and Cole were busy with while Marcus was tearing it up towards the end of Gears of War 3. In order to attain access to this second campaign, players will have to collect a certain number of stars during normal gameplay. Stars can be earned from completing parts of the normal campaign with headshots, executions, and other feats of strength and cunning. One of the ways to earn stars is through declassified missions, which are an optional undertaking. These missions are a system that will add extra challenge and depth the main campaign. Gears of War: Judgement will be released on March 19th for the Xbox 360. It will feature up to four player online cooperative play, and two player local co-op. Take a look at the video below that showcases the new campaign, and see what all the buzz is about.